An Ankle Brachial Index is a test that can indicate the presence of’ furring’ in the leg arteries, a common cause of poor circulation to the feet. Systolic blood pressures are taken in the arms and divided by the pressures recorded from the ankle. Healthy leg arteries would exhibit little difference between the arm and ankle pressures (1.0 – 1.3).Readings between 0.8-0.9 would indicate modest PAD, readings between 0.6 -0.8 would indicate more established PAD and readings below 0.6 would indicate significant and probably symptomatic PAD. 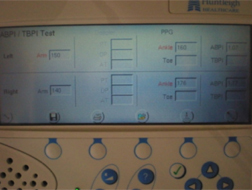 The test can be undertaken manually or by using a Photoplethysmography(PPG) machine. 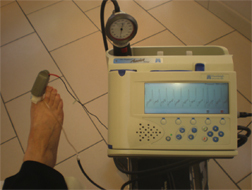 PPG provides more reliable results, and offers the practitioner the opportunity of viewing a waveform of blood flow via a PPG sensor attached to the tip of a toe. ABI readings of above 1.3 would indicate hardening of the leg arteries and therefore a Toe Brachial Index (TBI) is undertaken instead. Hardening of leg arteries produce high ABI readings since the arteries require more pressure to compress and therefore the toe arteries are used as an alternative (arteries in toes do not usually become hardened). This equipment is used regularly at this practice and is the main focus of our Diabetic Vascular Testing. 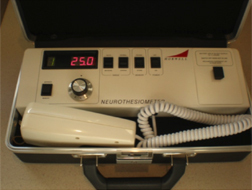 It is exceptionally rare for a podiatry practice to have access to such equipment and to undertake such testing. The test is useful in identifying Asymptomatic PAD in patients considered to be at high risk, particularly Diabetics. Where high risk patients are identified as having very low ABI readings and are symptomatic (where the poor circulation causes symptoms that affect the patient adversely) then we would normally refer to a vascular specialist via a GP for their assessment. This test provides the patient with the ‘Gold Standard’ in community based peripheral vascular testing and in line with diabetic protocol we encourage our diabetic patients to undertake this test annually. 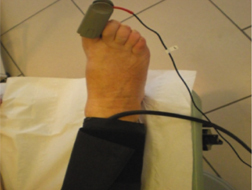 A Doppler probe is placed on the skins surface over the main arteries that supply the foot with blood. 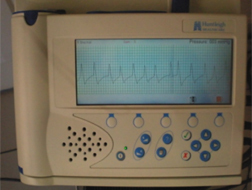 The probe translates the movement of blood into sound. An experienced practitioner will listen carefully and be able to detect if the flow is healthy. A healthy sound would be two or three separate noises in quick succession (Biphasic or Triphasic). Unhealthy arteries would exhibit a single ‘swishing’ sound (Monophasic). 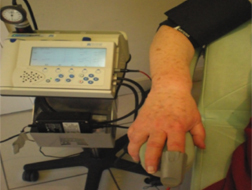 A Doppler is used routinely at this practice and its use is included during all Diabetic vascular assessments. 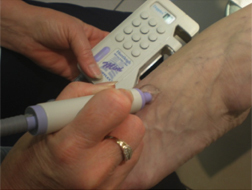 In addition to ABI’s and Doppler, vascular assessments would also include palpation (touch) of foot pulses, capillary refill timing, and a thorough visual inspection of the feet (a foot deprived of a good blood supply presents with thin shiny dry skin and reduced or absent hair growth & sweating). The ability to feel pain is an important protective mechanism in as much as it draws attention to a damaged area thus prompting the patient to act. “Illness is the most heeded of doctors: to goodness and wisdom we only make promises; pain we obey”. . (Marcel Proust). Traditionally the method of testing a patient’s ability to detect vibration would be to use a tuning fork; however at this practice we use a Neurothesiometer that will deliver a vibration at a set strength and will produce more reliable & consistent results than a tuning fork. A monofilament is a thin nylon bristle that is pressed against the skin. Any pressure exerted through the monofilament in excess of 10 grams will cause the monofilament to buckle and therefore limit the maximum pressure exerted to 10 grams. The filament is ‘prodded’ over several strategic areas of each foot and the patient will be asked to indicate if they can feel the filament each time it is pressed against the skin. It is recommended by Diabetic specialists that Diabetics should undertake annual vascular & sensory testing. The testing undertaken at this practice is amongst the most thorough available in private practice and is the ‘Gold Standard’ for community based peripheral vascular testing. The tests take approximately 30-45 mins to undertake and cost £42. The results are discussed with each patient and a copy is given for each patient to present to their Diabetic Nurse. When making an appointment please specify to the reception staff that you require an appointment for a ‘Diabetic vascular & sensory test’ ( as opposed to a standard consultation appointment ) as it takes a little time to set up the equipment and therefore must be pre arranged).